Platelets are cells in your blood that help in clotting during injuries. These cells are loaded with growth factors that help in stimuating the hair growth.PRP or Platelet rich plasma is the use of the patients own platelets, that is delivered to the hair roots to induce hair growth and prevent miniaturization of the hair follicle. It can be used as an adjuvant treatment with the topical applications or can be used with the hair transplant surgery to improve the recovery and the results. 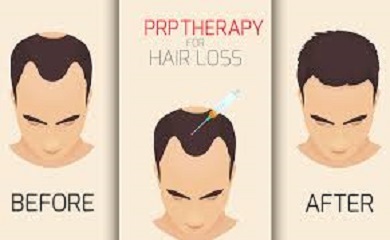 What are the Indications for PRP – Hair? Hypotrichosis (fine/reduced hairs) of the eyebrows or beard. What are the Indications for PRP – skin? First a small quantity of patients own blood is collected and will immediately centrifuge it in order to separate the RBC and the plasma rich in platelets. The session takes approximately 40mins -1hour. What are the post procedure instruction? Counseled about slight heavyness or soreness which will resolve in few hours. As patients own blood is being used to inject into the scalp or skin there would be no risk of a foreign body reaction or hypersensitivity . Slight initial pain or mild redness which is transient is experienced by few patients and will settle in few hours.